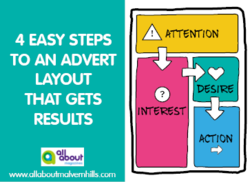 Creating a good and effective advert layout for your own business is not easy. Your first thought would probably be to put your logo at the top and then you get a blank. What to say, how to say in with few words, how make it stand out, what to include, are all questions that will go through your head. First of all, if your logo does not say what it does on the tin (like P.B. Plumbers) and if it is not as recognisable as Coca Cola, then it does not belong at the top, but at the bottom. It is important to know that, but what to put at the top if it is not the logo? A picture to draw the eye is always good to include if space allows it. People are overloaded with information and if you want them to spend more than 3 seconds looking at your advert, you need them to stop and read. But make sure you use a picture that is relevant and of good quality. 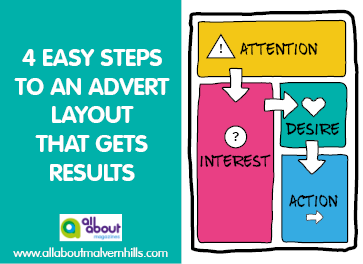 The purpose of an advert is to get someone to take action (pick up the phone, email, visit the shop or website), not to include everything you do and have on offer. It is not primarily a selling tool but a should create a reaction, so you can find out what it is they need and how you can solve their problem. And ultimately sell. But what to say? You probably have so many services, it is hard to fit it all in. When creating a clear and concise message, I always think of the example of a massage therapist. If I have an ache or a pain I want to get rid of that ache or pain. I am not interested in how that is done, but I need reassurance it will go away. So a list of all the types of massages available, including some that I have never heard of, will not make me pick up the phone to make an appointment. But a list of problems - including my ache or pain - that can be solved, will make me do so. And you will be surprised how often a clear call to action is missing. Details are incomplete, or the opposite, too many are included and you don't know which one they want us to use. And no urgency. Why would you ring now? Although we cannot all be experts in design and marketing, there are few ways to come up with a good and clear message that will work. An easy way to go about it is to use the concept of AIDA in your design. The A stands for Attention - what is your headline, how can you get someone to read your message? You can use a question, you can use a statement or mention a real problem you can solve. The I stands for Interest - 'What is in it for me? ', a special offer, a voucher, half price for first visit are ideas of what you can use. The D stands for Desire - What are the benefits you can offer the customer, what problems can you solve, before & after, how soon can you help? 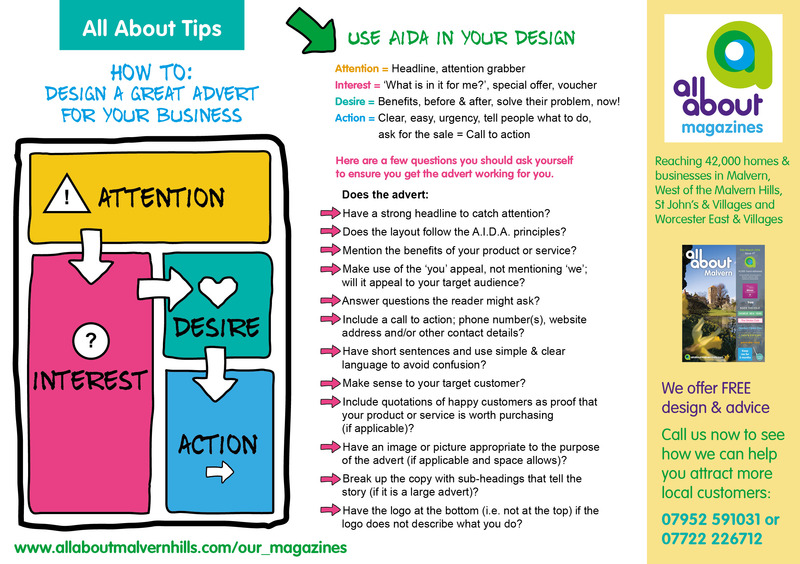 The A stands for Action - Tell people what to do next; visit a shop or a website, call for more information, email some details. A clear, easy and urgent call to action. Does the layout follow the AIDA principles? Make use of the ‘you’ appeal, not mentioning ‘we’; Will it appeal to your target audience? Include a call to action; phone number(s), website address and/or other contact details? Have short sentences and use simple & clear language to avoid confusion? Make sense to your target customer? Include quotations of happy customers as proof that your product or service is worth purchasing (if applicable)? Have an image or picture appropriate to the purpose of the advert (if applicable and space allows)? Have the logo at the bottom (i.e. not at the top) if the logo does not describe what you do? And finally, is what you have written legal, honest, decent and truthful? You can download a printable sheet with the summary of this blog below.